He-Man and the Masters of the Universe Magazine #15 is the Summer 1988 issue. This one is Africa-themed. There’s a two-page feature on wildlife in Kenya; there’s not much in the way of content otherwise. The do-it-yourself activity is animal masks; neither the puzzles is He-Man themed. Following last issue’s cliffhanger, in “The Tournament,” He-Man and Skeletor appear on an alien world, where Kirchner borrows heavily from the Filmation episode “The Arena.” How do they get home? You’re on your own for that. This issue’s lone Norem poster is the full gatefold edition of the cover, with He-Man riding a lion and Skeletor leading a herd of elephants near Mount Kilimanjaro. 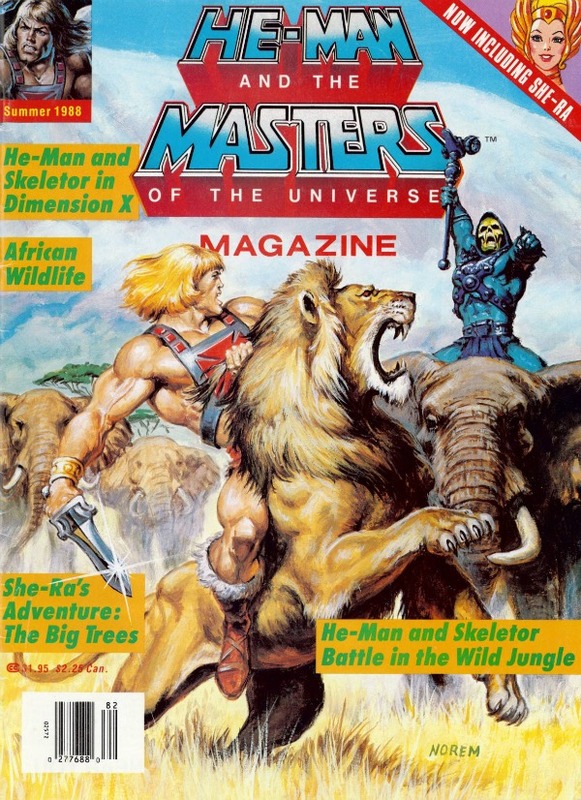 One thing, though: somebody at the magazine doesn’t know what the heck they’re doing – this scene clearly takes place on a savannah – the handful of trees here are all acacias – yet the caption reads, “The jungle is the setting of this battle between He-Man and Skeletor” (they made the same mistake on the cover). Wow. Also included is a bunch of Captain Power Magazine content, which is perhaps the writing on the wall that the end is near (well, that plus the fact that the people responsible for this magazine seem to be trying even less hard than usual).